There are a few motorcycle rental shops in Vientiane. Douang Deuane Hotel, PVO and Lucky Motorcycle Rental (not sure if they are related to Lucky! Lucky! 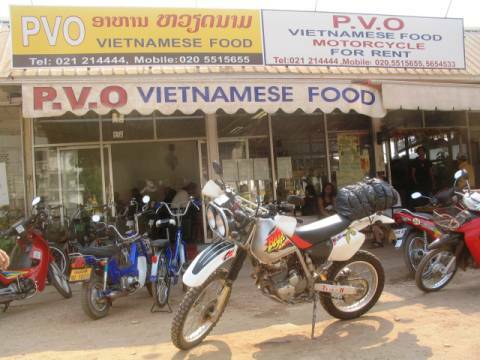 in Cambodia) are listed in the Lonely Planet Laos guide and PVO is recommended as the best place for 250cc bikes hire. A Honda Baja at PVO cost US$20 per day. Another place that rents out scramblers is Green Discovery, a company that also conduct motorcycle tours. Depending on the number of days of hire, they charge between US$25 to US$28 per day for a Honda Baja. A useful service they provide is that they allow one to pick up or drop off the bike at any of their branch offices. The branch offices are located in Luang Namtha, Vang Vieng, Luang Prabang, Khammouane and Champasak while the head office is in Vientiane. It cost between US$20 to US$40 for the service. I ended up choosing PVO as they are cheaper than Green Discovery. However, I would seriously consider Green Discovery if I am not traveling in a loop. They would be a good choice for a Southern Laos ride from Vientiane to Pakse (near Champasak). PVO is headed by Mr Chanhtha Soukhummalay. Guidebooks and name cards might put PVO at 344 (or 314) Samsenthai Road but they had moved to Fa Ngum Road, along the Mekong river. With their big sign board, it is hard to miss them at the eastern end of Mekong promenade. Their email address is [email protected] and phone numbers are (856-21) 214444, 020 5515655 and 020 5654533. 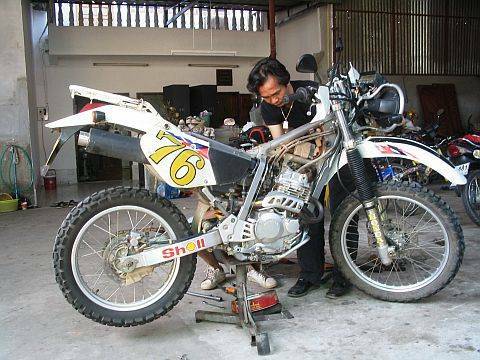 It is advisable to reserve a motorcycle in advance. I reached PVO without a reservation and all I saw at their shop were scooters. Luckily, someone had just returned a Honda Baja in the morning and the bike was at their workshop. PVO took me there and I waited for two hours while they washed and serviced the bike. They were very accommodating when I requested them to lower the motorcycle’s height. The Honda Baja is bigger bike than the Honda Degree and is a little too tall for me. PVO provides a basic set of tools with the motorcycle. Bike lock, rubber hooks, spare tyre tubing, chain lubricant and a bottle of engine oil are also given to the rider. So be prepared to add a sizable pack to your load. As usual, you have to deposit your passport and sign a motorcycle hire agreement with PVO. PVO also requires you to make payment in advance. If you run into any bike problems during your trip, contact PVO at the numbers found on their name card or on the prominent sticker pasted on the motorbike. While on the move, you are expected to check the engine oil and chain everyday, and maintain them if necessary. This entry was posted in Laos, Motorcycle Adventure Vacations and tagged green discovery, hire, honda baja, Laos, Motorbike, Motorcycle, pvo, rental, vientiane by atticus. Bookmark the permalink. I’m making my first trip to Laos and spending two nights in Vientiene. I want to rent a 250cc dirt bike and want to take a couple day trips, do you have any suggestions on where to go, stay, and what I should bring? You might want to take a look at my route but you might want to skip the Xayaboury part. My favourite places are Nong Khiaw and the Plain of Jars. We hired XR250 Baja and a XR230 (short legged wife) from James @ Remote Asia Travel. James is an expat Canadian (or maybe American) and was great to deal with. Bikes were in good condition and we had no issues along the way.